Recommendations: A book I always suggest to anyone in creation or in a creative role is the Quincy Jones Autobiography. The man is truly my inspiration. Not necessarily his achievements but rather from the adversity he experienced – it’s truly a wonderful read. A piece of music, maybe you should check my ‘Cinematic Experience’ DJ mix. It’s on my Soundcloud and it was tribute to a friend and a way to explore a deeper and melancholic relationship we had. The mix is (for me) extremely poignant and is designed to be listened to with the eyes closed. It’s dark, emotional and in parts uplifting, but in honesty quite painful. Event though I did it for ‘fun’ it’s still my favourite mix I’ve ever recorded. It was never released and really does not represent me as DJ - but rather me as a person. 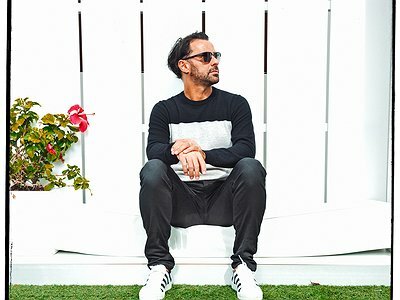 Website/ Contact: If you enjoyed this interview with Yousef, head over to his homepage and facebook profile for more information as well as current tour dates. And make sure to also visit the website of his label Circus Recordings. I’ve been a music enthusiast since I was very young, from the age 7 or 8. I wasn’t that into cartoons or toys (except Lego obviously!). My oldest brother got me into all sorts of music: new romantic, hip-hop, and the early street sounds of electro and acid house. This all led to my interest in DJing and before I was in double figures I knew I wanted to be a DJ. I followed this path and eventually, after time, I broke through - but it wasn’t until my career was in full swing that I begun to make music, about 10-12 years ago. My first tracks were produced with Paul Woolford (as our band name 10000BC) and then with Steve Mac (as Drum Bums). The guys taught me a lot but it was really through trial and error and many hours chipping away that enabled me to become a more accomplished and self sufficient producer. Yes, that’s exactly true. At the beginning when you don’t know which buttons do what, or how to program beats, it’s both daunting and frustrating. All you want to do is make a track rather than complete a project that you will be proud of forever. As time passes and you become able to stand on your own in the studio, you then find your style and become able to choose what you want to make, it gives you the creative freedom to actually express yourself as a proper artist. It’s because of time served in the studio that my output is pretty varied. I like to complete projects via any inspiration that comes, rather than making a track for a functional purpose. Don’t get me wrong, my tracks are now more dance floor focused but if you check out my 2nd album, you’ll find that it’s extremely broad - I guess it was made at the time I felt able to spread my wings more musically. Although I’m still making tons of music I’m aiming things more at the dance floor now. But I do try to keep a wider musical perspective, from a range of electronica to the heartbeat of house music (my true love), which always runs through everything I do. At the beginning the challenge was learning what is almost an entirely new language. I use Cubase, always have. But not knowing anything about the basics, yet having a full set up freshly bought was incredibly annoying. Although over time I persevered, picked up some pointers and finally became able to program my beats. As a new producer, I used to just throw together sounds, ideas, and samples in the hope that they would work – but they seldom do in reality. I’m not a musician, so finding a way to build a track/composition that musically works, but still has the raw feel I like was a difficulty. I think that might be why many of my tracks & remixes have string parts in them. I love the cinematic element, but it’s easier for me to get my head around musical development and movement. I don’t like to over-complicate musical arrangements, as I’m mindful I’m still making house & techno, but a correct key signature can really assist with the quality of your mix down too. So its become important to have even a basic understanding. I don’t think of my own techniques to be musically exansive, but if I want to include a complicated part then I have no problem in paying a session musician to join me for a short part of the process. My first set up was probably over the top to be honest. Bare in mind I’d only made a couple of collabs with Paul Woolford at this point, he too had a basic set up then. I bought a fully loaded mac, Cubase, a decent sound card, a microphone, compressor, a decent synth and a few other midi bits, but generally had no idea how to get them working together. So although I could get a track going, if the routing or connections ran into any difficulties, I was genuinely screwed for days. That was over 12 years ago, every producer has been there (or should of!). As time passed and I become fully able to produce and control a studio I began to get more kit. A new mac, a juno 106, a Sp1200, more recently a Roland GAIA (which I have to say is great), A Moog Little Phatty, Auturia full set up, and my trusty Korg Ms2000 and more recently my Pioneer Toriaz. I use Guitar Rig for textures and efx and of course Soundtoys to give my music a dynamic. I use drum hits and samples and occasionally (when it works) my TB 303. In my odd, untamed working process and style, I find that letting both your ideas and the machines capabilities flow can lead to the most interesting results. I don’t put limitations on what I’m trying to achieve, my main goal is does it excite me and has it improved my studio techniques? Machines (generally) do what you ask them to do, but just bending your own ideas (while always recording internally audio!) can be the most interesting part of any production process. The important part is knowing how you made a sound, not why. The co authorship is dictated by what style of music I feel I should make on that session. If I want to make a functional house banger, I’ll generally make a nasty drum kit on the Toriaz, and record it in to Cubase and then add sounds around it, keeping it raw and purposeful, and not too complicated, keeping an eye on the flow of the track and trying to get it completed quickly. On the other hand if (like my new track "Vivienne") I’m inspired by classical music then I will plan on using an array of strings (albeit in Native Komplete Kontrol) and my aforementioned keyboards to rally up texture, emotion and harmonics. I would say the irony of studio life is not knowing what tracks will just happen (like Vivienne) or what tracks will never see the light of day (like the 30 I have completed and mastered on my hard drive). For me the beauty of where I’m at as a producer is that I’m skilled and experienced enough to know that naiveté can be an ally. "Bending your own ideas can be the most interesting part of any production process. The important part is knowing how you made a sound, not why."